During the March holiday we brought the kids to a Fruit farm in Desaru, Malaysia. There was a small petting Zoo section with a limited selection of animals. It was the first time that the kids got to feed rabbits and goats. They were quite hesitant at first as the kids are not really into animals. Doggie boy was quite frighten to feed the rabbit and had to be coaxed by R before he gave it a try. I didn’t manage to get a good shot of the kids feeding the goats. The baby ewes were let out of the pen for them to feed but they really scared the boys when they went near to feed. Both the boys ran when the baby goat went near them. 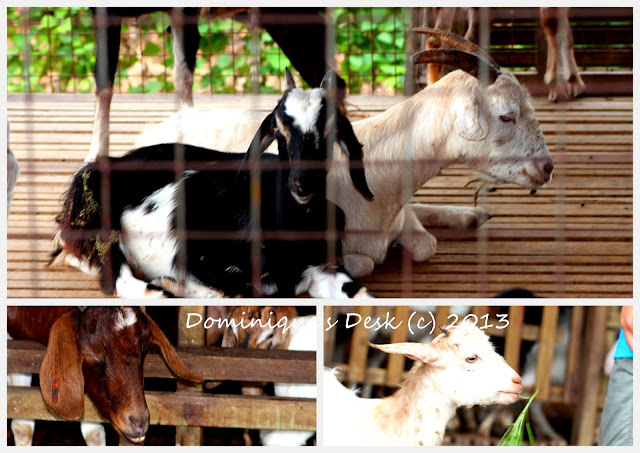 I guess if they encounter goats again in the future they would not be as fearful as the animal as they were that day. We didn’t get to go the Ostrich farm there while on holidays at Desaru but the kids did manage to take a look at the Lone Ostrich that we spotted at this Fruit farm. They took a glance of it and went off looking at the rabbits. I guess it wasn’t a bad decision not to visit the Ostrich farm during the trip. Thanks for hosting this, Dom! Love animals…these are beautiful pictures! Come link up with me at NanaHood.com Have a great week! These pictures are great. The colors are really bright, which is awesome. So cute! I love taking the kids to see little animals such as these! I would take the Rabitt and the Goat Please. Have a nice day. You always have such lovely pictures! Thanks for sharing! What a great experience for them. So cute. Oh your boys are so cute. Looks like a fun time, and the animals are neat too! My boys especially the elder one likes feeding animals minus the smell from the animals. Like the first picture of R guiding R2 to feed rabbit. It captures the fatherly love, the way he held his hand…. Beautiful, fun pictures…thank you so much for hosting! Looks like the kids had a lot of fun. I will never forget this one dairy had brought in ostriches near our home in the 70s. My grandmother insisted that we take our old bread and feed it to them. My grandfather was giving them the bread when one of them just didn’t like it, and spit it all over his face! Ha! That is one memory that is sure to last my lifetime. Petting zoos are always a fun experience for most kids. Thank you for sharing. Just remember that if you go to a petting zoo to take some wet wipes so that you can clean your kids hands to prevent the spread of germs, bacteria, and viruses from the animals. Such a nice experience for the kids! My son loves animals too. Last time we see a pet shop he tried to pick up the rabbit’s cage and bring them home. The rabbit is so cute. I bet my son would love to see those animals too. One day, I will bring him to Manila Zoo here. We love petting zoos, it has been awhile so it is time to go back. Great pictures.